Just as more American consumers than ever are ready to buy more energy efficient rides, it looks like the new Ford C-Max Energi Plug-in Hybrid (PHEV) is going to kick the Toyota Prius and Chevy Volt to the Curb. Last week Ford announced that the new C-MAX Energi Plug-in Hybrid (PHEV) is expected to achieve more than 20 miles of electric-only range - nearly double the Toyota Prius plug-in hybrid and the Prius plug-in- and is expected to travel up to 550 miles on a single tank of gas, exceeding the range of both the Prius PHEV (540 mi) and the Volt (379 mi). Drivers of the C-MAX Energi could travel round-trip from Los Angeles to Las Vegas or from Detroit to New York City on a single tank. Topping it off, C-MAX Energi delivers fuel economy that is the equivalent of 95 miles per gallon (MPGe) combined city/highway. Bill Ford explains his environmental roots. 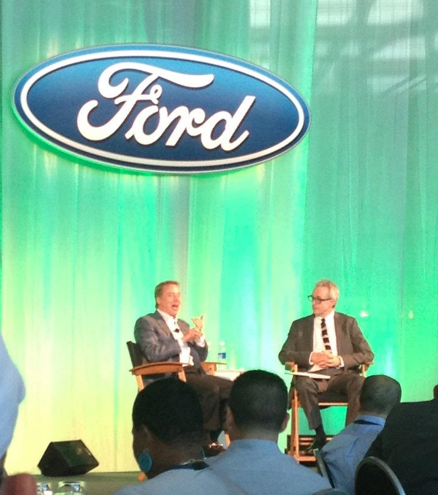 Recently when I was in Detroit I had the chance to hear Bill Ford explain that he has been working for over 30 years, since he graduated in 1979 from college, to reinvent Ford into an environmentally conscious corporation. He told the story of how in 2006 he sat down in is living room with Alan Mulally and they decided they were going to get out of the financial mess that they, and the other big car manufacturers found themselves in. Ford and Mulally decided to find a light at the end of the tunnel differently than other car manufacturers through standing on their own, not accepting government money and focusing on two main goals: #1 make Ford stand for and become THE leader in fuel efficiency and #2 become a technology leader. Ford then explained they decided they had to do the first, to deliver the second. With yet another great design in the C-Max Energi Plug-in Hybrid (PHEV), Bill Ford is delivering on his promised goals to consumers. 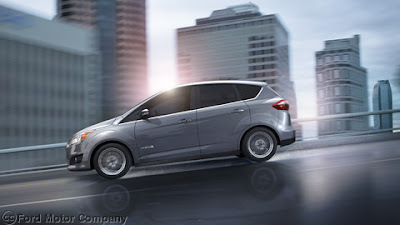 C-MAX Energi is part of Ford’s first dedicated line of hybrid vehicles in North America and will soon be available for order at Ford’s certified electric-vehicle dealerships. 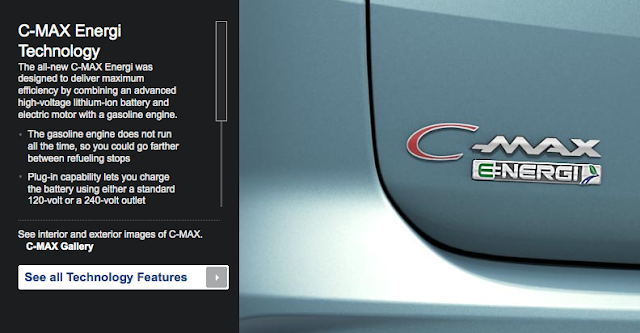 While the C-MAX Energi nameplate is new to the U.S. market, the technology and design has proven itself already in other ways and in other places. More than 144,000 units of the five-passenger C-MAX gasoline and diesel versions have been sold in Europe since late 2010. Though Ford is concentrating on hybrid versions of C-MAX in the U.S., the designs of C-MAX Energi and C-MAX Hybrid are based on the gasoline- and diesel-powered European version. I tried this out and it is exceedingly helpful technology for a busy consumer's life. I could certainly use it in my busy, life. 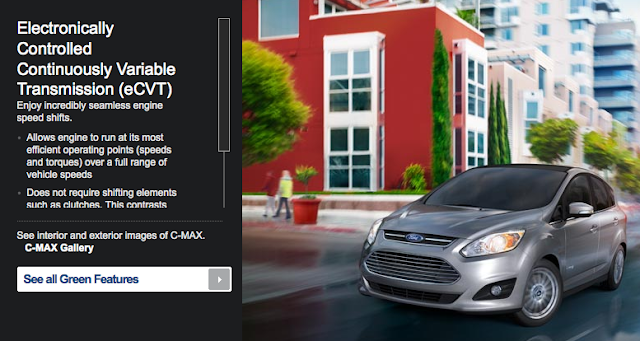 C-MAX Energi sets itself apart from other hybrids in other ways, too. For example, it offers the latest generation of SmartGauge® with EcoGuide. Designed to help drivers get the most from C-MAX, information such as instantaneous fuel economy can be displayed on one of two 4.2-inch LCD screens, helping drivers more closely monitor how their driving behavior affects the vehicle’s efficiency. C-MAX Energi will be produced at Ford’s Wayne, Mich.-based Michigan Assembly Plant (MAP) alongside the new C-MAX Hybrid, Focus, Focus Electric and Focus ST. You can get more information about how the MAP was transformed to produce fuel-efficient cars of the highest quality and find out more about the C-MAX Hybrid here.